Brushing: Step 1: Place your toothbrush at a 45-degree angle to your gum. Brushing: Step 2: Brush gently in a circular motion. Brushing: Step 3: Brush the outer, inner, and chewing surfaces of each tooth. Brushing: Step 4: Use the tip of your brush for the inner surface of your front teeth. Flossing: Step 1: Wind about 18 inches of floss around your fingers as shown. Most of it should be wrapped around one finger, and the other finger takes it up as the floss is used. 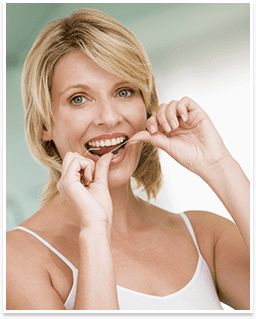 Flossing: Step 2: Use your thumbs and forefingers to guide about one inch of floss between your teeth. Flossing: Step 3: Holding the floss tightly, gently saw it between your teeth. Then curve the floss into a C-shape against one tooth and gently slide it beneath your gums. Flossing: Step 4: Slide the floss up and down, repeating for each tooth. 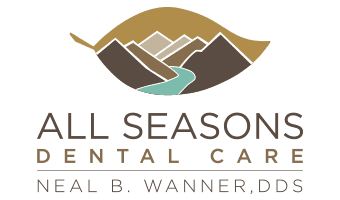 Remember to schedule regular checkups with your dentist every six months for professional teeth cleaning.